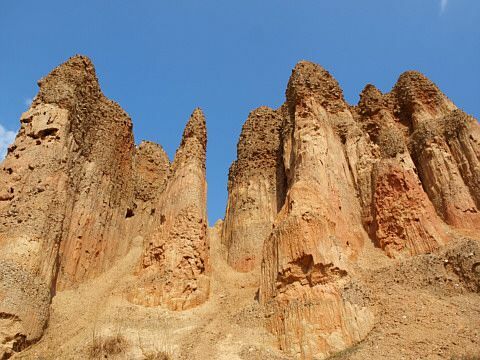 In the village of Dančići, in Pirni Do near Foča, people have the opportunity to see a unique natural phenomenon – sand pyramids that are located on the ninth kilometer of the old road Foča – Miljevina – Sarajevo. The pyramids were built of sand clay by erosion, in a way that the smaller sized material eroded and the blocks of firmer rocks remained. The shape of those rocks resemble the shape of pyramids, and because of their porosity, they are called the sand pyramids. This unique geomorphological phenomenon took years to create. Thanks to soil erosion and the impact of aggressive force of frost, summer heats, rains and strong winds, the figures of interesting shapes emerged. The striated sand pillars rise from their broad foundations and become narrower towards the top. In this way, they make up a unique geomorphological rarity in this area. What is interesting is that the erosion process last up to this day, so that the sand pyramids are not disappearing, but growing. A similar phenomenon is seen in other places in the world. Hence, with their shape and composition these sand pyramids resemble the pyramids in Colorado (USA), in the Dolomites (Italy) and the pyramids in Đavolja Varoš (Serbia). The sand pyramids are mentioned for the first time in the Austro-Hungarian period. According to some claims, they are older than 200 years. During the sixties, some frames of the film “Kapeten Leši” were filmed at this attractive locality. Lepa Đajić, Director of the Tourist Board of the Foča Municipality, said that this is a unique phenomenon that attracts tourists. “This is a natural phenomenon which is very interesting, given that it is unique in the region. Unfortunately, we do not have the instruments to measure the number of visits, but judging by the information obtained from local residents, visitors are increasingly interested in this phenomenon year after year,” Đajić said. Đajić added that the Tourist Board of the Foča Municipality soon intends to implement one project of landscaping of this locality, including the placement of new fence or sightseeing point, as well as the construction of a cycling trail that will pass right by the pyramids.